Fisheries biologists are worried that many of last year’s new pollock around Kodiak Island may not have survived recent warm ocean temperatures. The findings of a study on the issue were announced in January at the Pacific Anomalies Workshop in Seattle. Most people are familiar with the recent warm water anomaly by its nickname of The Blob. It’s a giant mass of warm water in the northeast Pacific Ocean that features temperatures of 2 to 8 degrees Fahrenheit above normal down to a depth of 300 feet. The Blob has persisted over the last two years and stretched from the Gulf of Alaska to Baja California. It’s different than El Niño, which is a phenomenon of equatorial warming in the Pacific. “There was a remarkable decline in the pollock larvae that we’re seeing in that survey,” said Russell Hopcroft of the University of Alaska Fairbanks’ School of Fisheries and Ocean Sciences. He presented results of research and other surveys on behalf of other researchers. He showed maps of pollock larvae concentrations overlaid with increased ocean temperatures around Kodiak Island early last year followed by other maps showing the absence of new fish surviving into the late summer. “It’s one of poorest recruitments that we can see in the time series,” Hopcroft said. He also presented a chart showing the results of acoustic surveys in the Gulf of Alaska. “You can see that the signal in the fall of (2015), literally there’s just nothing there,” Hopcroft said. 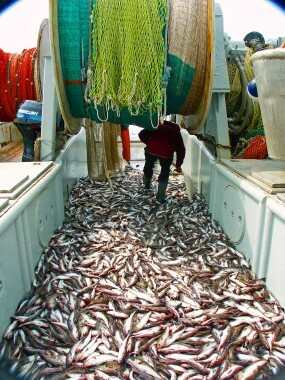 According to a 2014 report produced by the Juneau-based McDowell Group, the Alaska pollock fishery is the nation’s largest fishery. The value of all pollock exports reached $969 million in 2013. That included frozen pollock products like fillets. Exports also include roe, surimi, fish meal, and fish oil. Pollock accounted for 35% of all Alaska seafood exports by value.